Here you will find a guide about Flamingo beach, its attractions, location and activities. This beautiful area is located in Punta Salinas, northwest of Brasilito beach, just 75 km southwest or 1:15 hours from Liberia city, its located between Potrero beach and Brasilito beach. Flamingo beach has become one of the most luxurious areas in Costa Rica, this place has the country's largest Marina, besides being one of the most important sport fishing points in Guanacaste, here you can find sailing fish, tuna fish, swordfish and marlin; among many other species; every year this beach is host to a fantastic international sailfish tournament sponsored by the Costa Rica Amateur Fishermen's Club. Moreover, its stunning white sand and clear blue waters, offer the ideal place for your vacation. In this beach you can practice many water sports, beside Flamingo beach is located very close to the Santa Rosa National Park, The Nature Reserve Palo Verde and Las Baulas National Marine Park, you can visit these amazing places and enjoy nature. 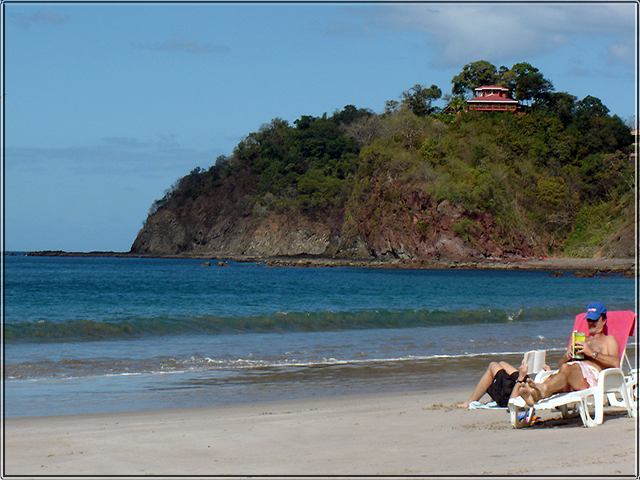 Also, Flamingo Beach is considered one of the most beautiful beaches of Costa Rica. Near the beach there is a perfect place for golfers, a golf course of 18 holes, designed by Robert Trent Jones Jr. Also, diving is very popular for tourists. It provides the exciting experience of swimming alongside white sharks and an impressive array of beautiful tropical fish and amazing marine life. Flamingo beach is home to some of the most beautiful hotels and condominiums in Costa Rica, this due to its spectacular sea views. Unlike many nearby communities, Flamingo beach doesn't have center; this community extends from east and it is home to resorts and beachfront condos; therefore, life beyond the beach activities and water sports are limited to a few restaurants, if the visitors looking nightlife, they should head to the nearby beaches like Brasilito, Tamarindo and Coco. In Flamingo beach you spend unforgettable holidays, enjoying many activities like tours on a boat, surfing, windsurfing, diving, snorkeling, and you can enjoy too, an excellent tour watching dolphins and whales. The access to this beach is very easy, its proximity to the International Daniel Oduber airport, provides travel to the region without problems; Flamingo beach is also very close to a small airport in Tamarindo, where local flights arrive; and the customers from these airports can be transported by taxi to Flamingo beach. From San Jose, the capital of Costa Rica, you can take Interbus, this company offers shared service and private transportation to the main tourist destinations in Costa Rica. It's the best option to travel around Costa Rica; to learn more about Interbus routes, please access this link and if you'd like to book a shuttle please enter here. Remember if you want to know one of the most beautiful beaches of Costa Rica, please visit Flamingo, a small paradise in Costa Rica.